So on a walk to the grocery today, we noted that a flowering bush we had initially identified as Viburnum was, in point of fact, a crabapple tree in full fruit. Somebody go get a bag. 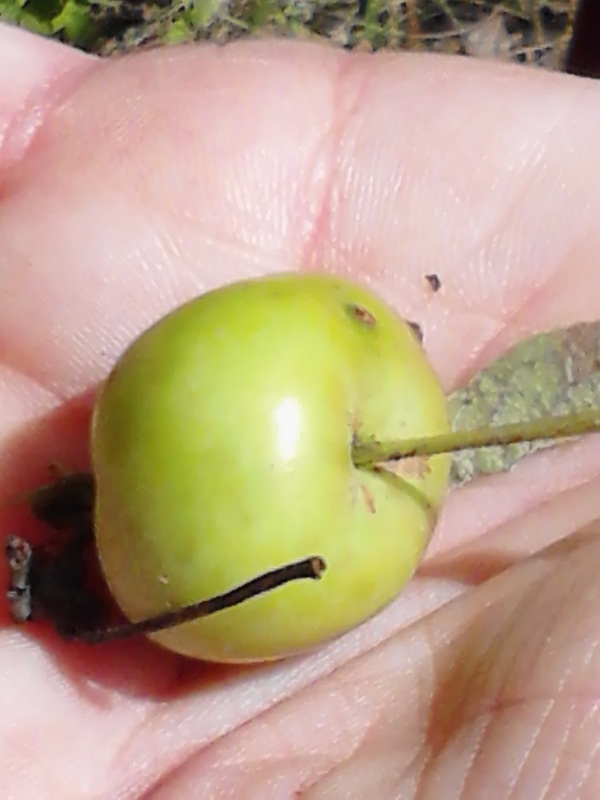 Crabapples are a primitive, small, sour, native American expression of the genus Malus, a relative of the rosebush, and in this case, a pretty prolific one. They are also yummy, a great fodder for jams and jellies and ciders, which is likely what these are destined to become. Wild crabapples from unpruned trees don't get much bigger than this. The small, hard fruit get a blush when ripe, which these were beginning to acquire. I repeat, somebody get a bag. The clusters are rather cherry-like, and easy to pick. 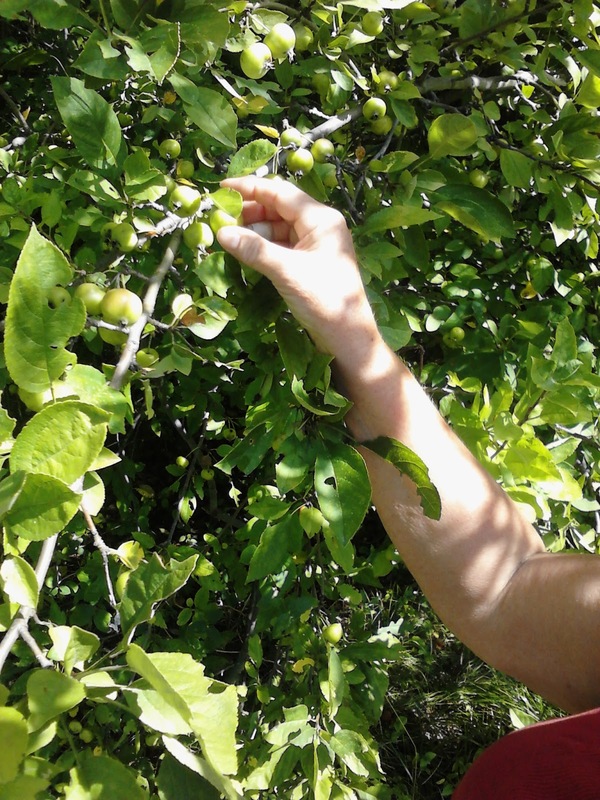 So we'll be picking a mess of these as they ripen and turning them into a lovely hard cider for the winter. To see that process as it unfolds, drop on over to our Onboard Cooking blog in weeks to come. 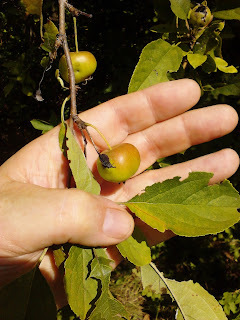 Even in a relatively urban area like the one in which we dock, there are multiple opportunities for some wonderful foraging. Much of the terrain, even in cities, was once part of a farmstead or home, and many of those plants, now gone native, are still there, still happy, and still available for the picking. This year alone, we've gotten some great wild raspberries and now the crabapple crop. Get out there and look around. I pretty much guarantee, you'll find something within a few blocks of where you live that's edible and thriving, often in the weirdest and most unexpected places. No, I'm not talking about the move aboard, though this is part of that. I first noticed it during this last week while we were out doing laundry. The local laundromat is one of those large, overly bright spaces with a billion machines and nine--count em--nine big screen tv's all going at once at full volume. Eight of them featured quiz shows full of manically grinning, wildly overly excited people screaming and bouncing up an down over winning another toaster that they won't use. The ninth, in the children's corner, featured similarly manically excited adults, screaming and jumping up and down in the ecstasy of counting to five. It was all kind of too much. We folded the clothes and virtually RAN out of the place. Now don't get me wrong, in the past, this would just have been background noise. I might even have sat there and dully watched the screens while the laundry churned. I realized, though, that something had changed, not in the TV shows, but in me. Once they were just there. Now they seemed infantile, irritating, and impossibly vulgar. I thought about it all the way back to the boat. Since we'd moved aboard, we had been able to give ourselves the one thing that work and jobs and income hadn't been able to buy us: Time. We'd been living in a beautiful place, full of the sights and sounds of nature. There was time now for introspection, time to do things we'd never had or taken the time to do: Time to talk to people, time to think about things, time to start projects and take walks and just sit in contemplation. 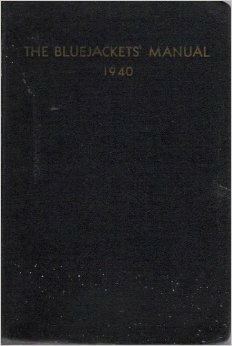 We began, almost without thought, to take more and more control of our own lives. Both former restauranteurs, we began cooking more, making meals from scratch because we enjoyed it, and in the process, eating far more healthily. Unsatisfied with commercial products, we started experimenting, roasting our own coffee, making our own deodorant (no fooling), compounding our own toothpaste; we started a vertical pot garden on the shanty boat, growing our own fresh vegetables and herbs. Our local explorations led us to local farm stands and gardeners. We had the time to walk virtually every day. In the course of this boat project, I'd lost nearly 30 pounds. My blood pressure--borderline hypertense--dropped to 117/63. Bizarrely, my hair and beard seems to have stopped graying. Before, dealing with bureaucracies and money and schedules, we had been frazzled, often angry, and tired. Now we were, by and large, (dare I say it) happy. In so very many ways, this move aboard has changed the way we live and the way we feel. Time for yourself is out there waiting for you. The only secret is deciding what's important in your life. But more than that, during our downsize, we were forced to change the way we related to the possessions in our life, to things. 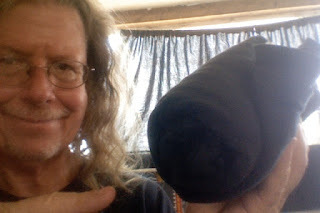 Our lives are far from monastic, but we were forced to pare our possessions down to the things that we actually used, or that actually had some meaning to us. We had to make decisions as to what things we truly wanted in our lives. So it should not be surprising to find that we had, to a very great extent, unplugged from consumer culture, from the culture of the race for possessions, and that we were now, in some weird way, viewing it from outside. It was a rather rattling experience. The secret, folks, is time. Simplifying life to a boat or a tiny home, to a small apartment or a cabin or just as an act of self-possession can give you the freedom to just stop and take note of your own life, something which, I suspect, commercial interests would really rather you not do. Once you find a slower, more gentle pace, all the other benefits--physical and mental--seem to follow. Give it a shot. You have nothing to lose but a lot of crap you aren't using, along with your next heart attack. We've had so very much interest in our composting toilet setup lately, both here at the marina and from other websites, that I thought I would post some of the questions that we've been getting. The system has worked wonderfully for us over the year: a simple bucket and sawdust composting toilet rig with no moving parts, things to pump out, chemicals to use, or smell. The setup we use, its construction and operation is detailed on an earlier blog here. 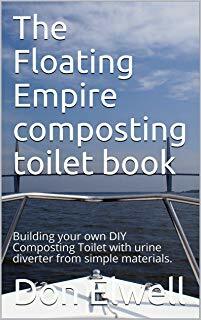 Composting toilet setup aboard Floating Empire. 1) Are there different kinds of composting toilets? What kind do I need? Yes, there are several. First there are the continuous process toilets like the Clivus Multrum. These continually turn the waste into dirt, generally through a gravity fed process. They work great and with little or no attention, but are huge and far more suited to a home or business. Then there are the "self contained" composting toilets like Envirolet, Nature's Head and others. These store the waste in a barrel or drum which is agitated to aerate the mass. They often also include a urine separator. They work well on vessels and cut down on the frequency of your having to empty them, but they're pricy, often running near $1000 for the toilet setup. Batch digesters are the simplest. These can range from a drum that is changed out and allowed to ferment when full to a simple bucket and sawdust toilet that gets dumped into a compost pile or into the trash. They are extremely inexpensive and work well. It's what we have and what I recommend. 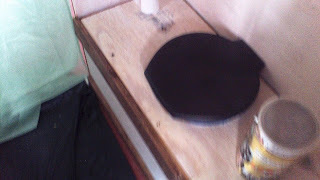 We use the "luggable loo" snap on toilet seat from Reliance on top (there are others) which cost us all of about $16 US. (Please note: there is also a wooden seat and bucket toilet available called the "Loveable Loo". Nice system as well, but somewhat more expensive). 2) What kind of biomass can you use in the toilets? Can I use cat litter? Any dry, absorbent material will work. Classically, dry sawdust is used, but any number of things can be used: Dry leaves, coir (coconut husk fiber), shredded cellulose. . . .anything that will lock up the moisture and allow air to circulate to the rest of the waste. Remember, you want to create a situation for aerobic (oxygen containing, which smells like dirt) decomposition as opposed to wet, anaerobic (which smells like. . . well. . .sewage) decomposition. 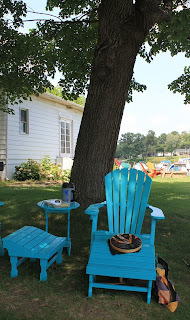 Aboard Floating Empire, we mostly use wood stove pellets, which are made of compressed hardwood or softwood sawdust. We find it compact, cheap, and easy to handle. While pine based cat litters (look at it. Its mostly wood stove pellets. . . no kidding), will work fine, clay based (clumping or not clumping) cat litters will not. They keep air away from the waste, and that's not what you want. 3) Will these meet Coast Guard regulations? Yes. They are largely considered type III non discharge waste treatment systems. Simple bucket systems are generally considered 'waste containment' systems, not waste treatment ones, and are not regulated. 4) How often do you have to empty it? Hard to answer accurately. It depends, of course, on it's use. Using a simple bucket system with no urine separation, the two of us wind up emptying the toilet about every two or three days in winter (when we're on the boat most of the time and not hanging out on shore). Urine separation will extend your time and cut down on the biomass you need to add to keep the waste mass dry, but do note that you'll have to find somewhere to dump the urine. Parenthetically, most of smell from pretty much all toilet systems is from urine, not solid waste. We recommend, if you're using a bucket system, having two buckets available for the head. There will be times when it's getting full and you won't wish to or won't be able to get ashore to dump it, so just switch out the buckets, snap a lid on the full one, snap the seat on the empty one, and dump them when convenient. 5) Can I use toilet paper? Yes. We recommend single layer stuff, which breaks down more easily. 6) Should I put in disinfectants, antiodorants, or other stuff? No. They'll just interfere with the composting process and may result in MORE smell. As it is, with enough biomass, the toilet should smell like damp dirt--which it is--even if you stick your nose in it. . . .which we don't necessarily recommend. 7) Can I put in tampons, sanitary napkins, disposable diapers, dental floss, etc etc etc. Not recommended. Most of the above products have things in them that either won't break down or do so very slowly. We recommend a separate trash container for this stuff. 8) Doesn't it look gross? It looks like wet oatmeal. 9) Would you consider going back to a wet, blackwater marine head? Not on your freaking life. I've never met one that didn't reek, they jam, they overflow, you have to have them pumped out.. . . .no thanks. 10) Are there other sources for information on this? The bible on this sort of thing is a work called "The Humanure Handbook" by Joseph Jenkins, available on Amazon here and through humanurehandbook.com. I recommend it highly. 11 to infinity) Doesn't it smell?